Oftentimes, people will overlook their mattresses at being the culprit for their lower back pain. Your bed is where you spend about a third of your life. It only makes sense that if you have the wrong mattress, something will go wrong with your body during that exorbitant amount of time. You can go to a back specialist or a chiropractor to treat back problems and maybe get to the cause of it, but a lot of the time you can just look at your mattress. We have all seen the commercials for these beds that prevent and cure back pain, but are they the fix for you? Is Your Bed Causing Back Pain? If you have an older coil (inner-spring) mattress, check it in the middle to see if it is dipping into itself. This is an easy tell to see if your bed is the reason you are aching all day. Your spine should be able to rest in a straight line while you are sleeping. 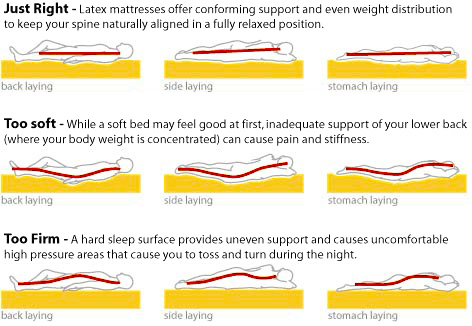 With a sagging mattress, your spine is bent in an unnatural position all night. This ultimately leads to back pains and further problems into your life time. If you don’t have a sagging mattress, feel how soft your bed is. If it is “plush”, then you might have a problem with your bed having to much give. This is another scenario where you will find yourself sleeping with your spine out of position all night long. If neither of these are the case, you should probably speak to your doctor to find out if there is a deeper issue involved. There is no single best mattress out there for your back pain. There are a few options that you should consider, namely memory foam and latex mattresses. Both of these beds have been shown to be a great benefit to people suffering from back pain, fibromyalgia and insomnia. Both of these kinds of beds are great for people with back pain. Figuring out which one you should get will be a matter of preference. The technology for memory foam mattresses originated with a NASA test for new materials for astronauts in space. The original plans for the material were scrapped, but they ended up creating a great new product, one that they didn’t know what to do with. Tempurpedic was the first company to adopt the use of memory foam for consumer use. They created a mattress out of if that was firm, yet had the ability to contour to the shape of a person’s body. The technology to create these beds has changed over the year bringing higher quality mattresses for lower prices. The use of latex in our bedding is a newer trend. Using two different types of technology to set the molds, mattress manufacturers have been able to make affordable latex mattresses that customers love. Latex mattresses have most of the same benefits as memory foam mattresses, plus they are usually lighter and have a bouncier feel to them. Some people will prefer the extra lift while others will be more inclined to sleep on a memory foam bed. 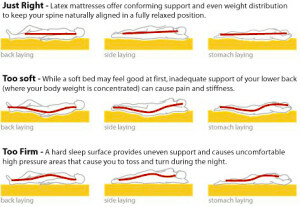 Both latex and memory foam mattresses can help you out with your back pains. You should first consult your doctor to see if there are any serious problems with your back before making the change. Choosing between memory foam and latex will be up to you and your preferences. You can feel how both of them are in a showroom, and then we recommend you shop for a mattress online. Look for a mattress with a 60-90 day sleep trial so that you can really test out the mattress and see if you like it and if it helps your lower back pain. If you don’t like it, then you can return the mattress for a full refund with your sleeping trial.